Other number 232 On a label on the glass tube. Other number XS1 On a label on the glass tube. 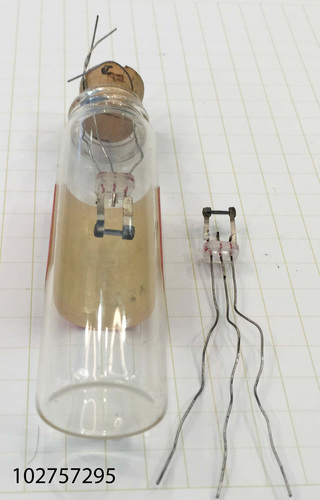 The object is a grown-junction experimental transistor suspended in a glass tube secured by a cork. The center point contact is intact. Per Jack Ward, Transistor Museum - "experimental grown junction transistors. Early to mid-1950s. Raytheon did not produce commercial grown junction transistors, and instead was the high volume leader in germanium alloy junction types. Other early transistor manufacturers, such as Western Electric and Texas Instruments, did successfully manufacture grown junction types, but this technology was technically challenging, and was soon dropped for germanium devices. However, Texas Instruments did use grown junction technology for the first commercial silicon transistors, which were announced by TI in 1954. Raytheon and other germanium transistor companies rushed to reproduce TI’s success with silicon technology and experimented with both grown junction and alloy junction silicon transistor types. The two units in this lot appear to be examples of Raytheon’s experiments with grown junction technology, possibly to determine feasibility for commercial production. 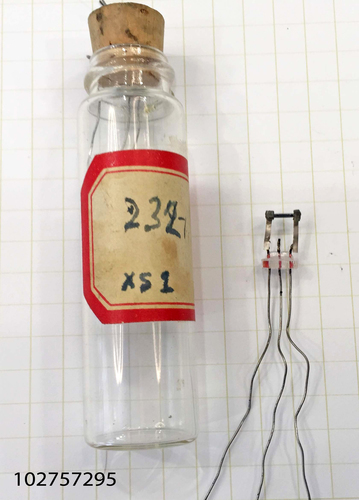 Determination that these two units are grown junction devices is based on a visual inspection the actual structure of the transistor junctions and on a handwritten label “Grown Junction” on the box containing these specimens. These units may be either germanium or silicon, but no measurements have been made to positively identify the device type. It is possible that the handwritten label “XS1” designates Experimental Silicon 1”, but further research is required to confirm. Extremely rare - these are the only known examples."